North Carolina Repeals Portions Of Controversial 'Bathroom Bill' : The Two-Way LGBT activists say the bill is not a true repeal and would leave in place "the harms of the discriminatory HB2 law." Gov. Roy Cooper says the bill is not perfect, but it's "an important step." 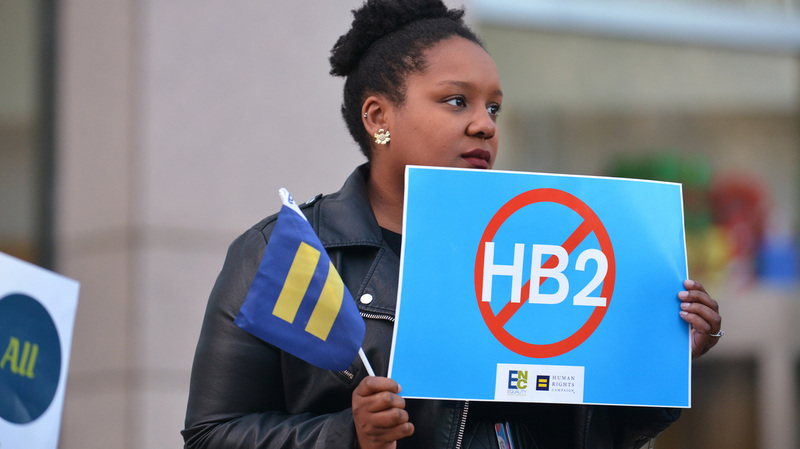 Cassandra Thomas of Human Rights Campaign holds a sign advocating the repeal of HB2 on Dec. 7, 2016, in Charlotte. North Carolina has repealed portions of the state's controversial "bathroom bill," including the requirement that trans people use the bathroom that matches their birth certificate, member station WUNC reports. Democratic Gov. Roy Cooper said he has signed the repeal measure, which he said is "not perfect" but is "an important step forward." At a news conference on Thursday he said the compromise repeal, which leaves in place a temporary prohibition on local anti-discrimination measures, was a necessary compromise with a Republican-controlled Legislature. "It stops short of many things we need to do as a state," he said, calling for a "clean repeal" of HB2 and statewide LGBT protections in the future. The compromise deal was announced late on Wednesday by Cooper and Republican state lawmakers. They said they had agreed on a way to repeal portions of HB2 — just in time for a deadline set by the NCAA. The agreement removes the limits on trans bathroom use but "would still leave state legislators in charge of policy on public restrooms," WUNC reports. Like HB2, it also blocks local jurisdictions from passing anti-discrimination measures protecting LGBT people — but only until 2020, instead of indefinitely. Cooper also emphasized on Thursday that the compromise measure allows local governments to set LGBT protections for their own employees and contractors, even though they can't set them for the public. Debate on the measure showed Democrats were divided on the measure, WUNC's Jeff Tiberii reports. You can see more coverage of the debate at WUNC's website. LGBT activists quickly denounced the proposal, which would limit the ability of local officials to extend protections to transgender citizens for several years. Cooper acknowledged that he was frustrated, even as he defended the compromise. "Under HB2 that kind of justice was permanently denied," Cooper said, whereas under the compromise it's only delayed. "I wish it were sooner than 2020, I really do." The compromise has also angered some conservatives who supported the original measure. One senator who supported the bill spoke during the Senate debate on Thursday, calling it "at best a punt; at worst, a betrayal of principle," Tiberii reports. Republican leaders Rep. Tim Moore and Sen. Phil Berger of North Carolina's General Assembly said in a statement late Wednesday: "Compromise requires give and take from all sides, and we are pleased this proposal fully protects bathroom safety and privacy." According to Moore and Berger, the bill leaves regulation of "multi-occupancy facilities to the state" and puts in place a "temporary moratorium on local ordinances similar to Charlotte's until December 1, 2020, to allow federal litigation to play out." Cooper, who eked out a win over former Republican Gov. Pat McCrory in November's election, said he supports the bill. The agreement was reached shortly before a deadline that would have caused North Carolina to lose the option of hosting NCAA basketball championships, Reuters reports. The college athletic association and other civic and business groups had taken steps to sanction or boycott North Carolina because of the law. It's not yet clear whether the deal will be sufficient for the NCAA. Lawmakers passed HB2 in March 2016 under McCrory. In addition to the bathroom restrictions, the law also limits localities' ability to pass nondiscrimination protections and minimum wage measures. State lawmakers passed the measure in response to a Charlotte ordinance that would have protected the rights of transgender people to use restrooms corresponding to their gender identity. Chad Griffin, president of the LGBT rights organization Human Rights Campaign, tweeted that the deal was a "state-wide prohibition on equality" and "doubles down on discrimination." Any ally of the LGBTQ community cannot support this new version of #HB2. There will be political consequences for those who do, Dem and Rep. Previous deals to repeal HB2 have fallen apart. Earlier this week, The Associated Press estimated that a continuation of HB2 would cost North Carolina $3.76 billion over the course of 12 years.